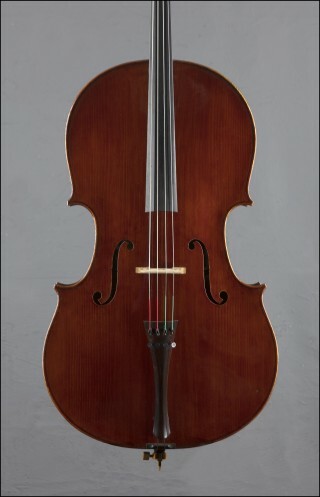 The two celli that were owned, and played by Robert Jamieson were being offered for sale. One was made by Domenico Montagnana in Venice, Italy in 1730. The other is a copy of the Montagnana made by William Robert Scott and myself. 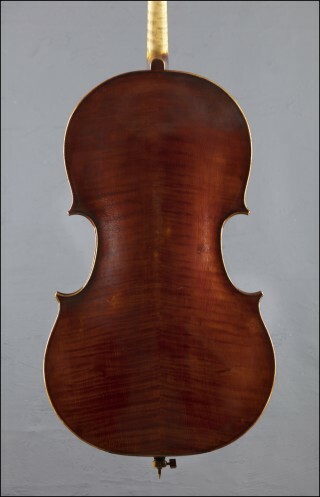 The Montagnana cello is sold, but the copy is currently available in my shop. "Bob" died on Feb. 13th, 2018 at the age of 94. bob was born in Santa Monica, California, and started playing the cello when he was 7 years old. By High School he was performing professionally in the Brodetsky Ensemble. He served in the 370th Army Air Force Band and Armed Forces Radio Service during WWII. In 1946, he won the LA Philharmonic younf artist's competition. At the age of 23, Bob joined the LA Philharmonic as assistant principal cellist. He also played for many motion picture soundtracks in Hollywood. Bob moved to New York in 1948 and joined the New York City Opera and Ballet, toured with the NBC Symphony under Arturo Toscanini, and studied and performed at Tanglewood. Bob became principal cellist with the Minneapolis Symphony (now the Minnesota Orchestra) in 1951 and retired from the orchestra in 1991. Bob was also an avid chamber musician, perfoming with sevearl groups. He taught hundreds of cello students in his private studio and as an adjunct member of the faculties of the University of Minnesota, University of St. Thomas, University of St. Catherine, and Macalester College. After retirement, Bob continued to play the cello, as well as Gamba and recorder. Here are some pictures of the copy. If you would like to come in and try it, give me a call. John R. Waddle at John R. Waddle Violins, Inc.